Is one week in paradise ever enough? No is the answer, but that’s all the time I had to spend visiting the vineyards of northern California recently. Paradise? Well, with its seductive, rolling scenery, constant summer sunshine (with low humidity) and a gastronomic culture that’s as good as anywhere in the world, it will surely do. My visit took in the three premier wine counties, Sonoma, Napa and Mendocino. There’s a whole lot more to Californian wine than Napa and Sonoma. The Golden State boasts a hugely varied set of geological and climatic conditions. Those who’ve been lucky enough to holiday there will know that it takes only a few hours to drive from the scorching heat of the desert to the breeze-cooled coast, or from the chill of pine-clad mountains to the sun-dappled byways of the rural countryside. Agriculture exploits these local conditions too, from growing oranges and avocados, to apples and almonds. Though quality modern viticulture may have started in Napa and the north, vineyards now extend from close to the northern border with Oregon, all the way down to the southern border with Mexico. But whilst Sideways may have thrown the spotlight on Santa Barbara County, halfway between San Francisco and Los Angeles, it is northern California that remains the powerhouse of the premium wine industry. Just an hour north of San Francisco lie the Sonoma and Napa Valleys, where the biggest names of US wine can be found and which, along with Mendocino to the north, formed my itinerary on this trip. Though winemaking here can be traced back to 18th century Spanish missionaries planting vineyards to supply communion wine, the wave of European settlers in the mid-19th century saw the beginnings of a commercial wine industry. The growing industry only just survived prohibition when many vineyards and producers were lost, and its output from the end of prohibition in 1936 to the 1960s was confined to cheaper jug wines. It was not until the 60s and 70s that a new generation of well-travelled and ambitious winemakers began to plant quality varieties and make much more serious wines. The impact that the famous ‘Judgement of Paris’ had on the industry – when a Cabernet Sauvignon from Stag’s Leap beat Bordeaux’s first growths in a blind tasting – is perhaps overstated, but that event in 1976 is a reasonable point to mark a real ramping up of California’s quality wine industry. As ever, not everything in Paradise is as perfect as it first seems. There are undoubtedly issues vexing the minds of wine producers up and down the State, from water shortages and the potential effect of climate change on vineyards, to labour shortages with the pool of Mexican farm workers not as plentiful as it once was. There’s also a little bit of a reputation problem amongst European drinkers at least, who lazily categorise California’s wines as too big, too brash and too alcoholic. The ‘hedonistic’ fruit-bomb style of some wines propelled them onto the world stage, but it is a style that fell out of favour with many wine lovers. It is also a style that is harder and harder to find in California. Every winemaker I met was seeking subtlety and refinement in their wines, more carefully matching grape to site, and managing both their grape growing and their winemaking techniques to make a different, far less bombastic style of Californian wine. There is a new Californian wine, as witnessed again and again on my visit. One other problem remains: availability. A look at the top selling branded wines in the UK would suggest the California has a grip of the UK market. Competing against Australia, Chile, France and the rest, the top 10 selling wines in the UK as of 2012 showed Gallo at #1 (75 million cases), Mondavi at #4 (9.8 million cases), Beringer at #6 (8 million cases), Sutter Home at #7 (7.8 million cases) and Blossom Hill at #10 (5 million cases). California boasts five of the top 10 biggest selling brands, with E&J Gallo alone selling more than all of the others combined. But the wine lover looking to move beyond blush Zinfandel and sweetened-up cheap wines needs to work quite hard to find them. There are some California specialist suppliers around, such as Sir Peter Michael’s Vineyard Cellars in Berkshire and Calistoga Wines in Edinburgh, as well as online and independent merchants across the country. But small production and local demand means many of the most interesting wines do not reach these shores. For those lucky enough to visit California you will find each of the counties has a very well-developed wine route. There are abundant visitor facilities, and charming towns in the heart of wine country locations offer an excellent choice of hotels, B&Bs and restaurants. Strict zoning laws mean that winery restaurants are few and far between, and visitor numbers to wineries are strictly capped, so appointments are necessary at most wineries. This report is not, and does not claim to be, a comprehensive study of the three counties. In my brief visits I could see only a handful of producers in each and enjoy a few other producers’ bottles, including Williams Seylem and Robert Young, over dinners. But I did manage to see a diverse range of estates, from the biggest and best-known brands, to the tiniest artisans producing just a few thousand cases. Above: Paul Hobbs’ vineyard, Sonoma. Sonoma County is big. Much bigger than Napa, with several hours needed to drive between its northern and southern wineries. Its wine industry is also much more spread out: whilst the vast majority of Napa’s wineries can be reached just by driving up and down route 29 or the parallel Silverado Trail, Sonoma spreads across more coastal, mountain and valley locations. As with all of California, the last few decades have been about refining sub-zones within the county to focus on grape varieties that work best. For example, Russian River has become Pinot and Chardonnay central, whilst in the Alexander Valley Cabernet is king. These are just two of the better known American Viticulture Areas (or AVAs) within Sonoma County, but there are 15 of them in total, each with its own specializations from the sparkling wines of Carneros to the Zinfandels of Dry Creek. Key to grape growing across many of the AVAs is the Petaluma Gap. The ‘Gap’ is a low-lying area that forms a break in the coastal mountain range, allowing the marine layer of cool, damp and often foggy air to snake its way in to the interior. It also brings afternoon and evening winds, helping further cool and freshen the vineyards. The influence of the Gap is generally acknowledged to be the reason why the cooler climate-loving varieties like Chardonnay and Pinot Noir can do so well in certain locations, like in Hanzell Vineyards pictured above. The other moderating influence on the sunshine and heat of Sonoma – and California in general – is elevation. There can be dramatic differences in temperature between the valley floor and the hills and mountains of Sonoma County. Some vineyards sit over 2,000 feet in elevation, and that can change ripeness of fruit and the nature of acids and tannins. An historic Sonoma property littered with ‘firsts’ for California. Mike McNeill now makes beautiful and elegant wines. Super négociants Patz & Hall cover Sonoma and other appellations with their huge portfolio of single vineyard wines. Restless self-made man Paul Hobbs makes wines in California and in Chile, all to the same precise and exacting standards. K-J is a huge player in Sonoma, but there’s an elegance to the wines tasted here that is missing in some other brands. Making a fine range of Sonoma and Napa wines, David Ramey is a deep- thinking négociant, rooted in the French classics. Though this 100-year-old family business was sold in 2011, Ted Seghesio still makes the wine, with a nod to his Italian roots. 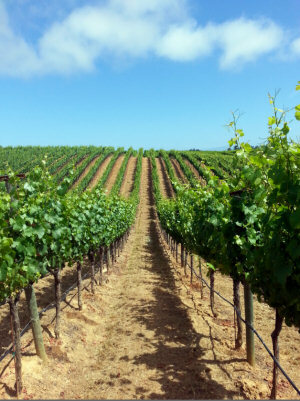 Napa has become one of the world’s great travel destinations. From hot-air balloon flights drifting majestically over the vineyards, to 3* Michelin dining in The French Laundry, Napa has become a playground for the well-heeled and gastronomic tourist. Summer and weekend prices in the area’s upmarket hotels, spas and B&Bs soar to eye-watering levels. That is one side of Napa for sure, and it is reflected to an extent is some of the region’s wine offerings. Wine columnist Eric Asimov summed it up rather pithily in 2006 when he wrote: “Billionaires buy pieces of Napa Valley, charge $150 a bottle for the first vintage and want you to understand, by the way, that they do it all for charity.” Asimov hit the nail on the head describing a Napa Valley that is alive and well today. But he also went on to talk about the other, “more modest,” Napa that exists in parallel. This is the Napa where thoughtful and patient farmers and winemakers are happy to operate somewhat under the radar. They are working on longer term plans to make ‘quieter’ wines that are the highest quality reflection of their vineyards. Both Napas exist and, depending on your viewpoint, both are there to be enjoyed. The Napa Valley is easy to visit. The vast majority of its wineries line Highway 29 and the Silverado Trail, the parallel roads that run along the valley floor. But do not think that Napa is a single, homogenous place in which to make wine: those American Viticultural Area (AVAs) with names like Howell Mountain and Mount Vedeer are not so named by chance: vineyards here can sit way above the fog line, straddling 2,000 feet of elevation. Rainfall is considerably higher too, giving distinctly different climatic conditions to those on the valley floor. And soils can differ greatly too. To the north of the valley, and high on the mountains, soils are mostly of volcanic origin, with pockets of deep red clay. Lower down and in the south, soils are sedimentary with deep layers of gravel and sand – this was once the ocean, part of San Pablo Bay. Though ripening grapes is rarely a problem anywhere in the sun-blessed Golden State, there are geological, topographical and climatic differences. In fact, for its surface area, the Napa Valley has one of the most diverse geologies on the planet. Given this diversity, why is it that Napa has a reputation amongst some wine aficianados for making only one style of wine: big, high-alcohol, sweet-fruited and solid reds that, basically, all taste the same? Whilst there is undoubtedly a grain of truth in this (some blame it on the chase for high Parker scores), it also tars this changing, developing region with too broad and too coarse a brush. Napa does do nuance and does do balance, and I got the impression from this brief visit that more and more winemakers are reconsidering what makes a wine ‘great’. Around the world consumers are beginning to appreciate freshness and subtle complexity over ‘gobs of fruit’ and ‘hedonism’. And Napa does have wines with these qualities. There has long been a discussion in Napa over mountain fruit and valley fruit: up on the mountains, temperatures are generally lower but sunshine is plentiful, and the soils are poor. The result is grapes that can hang a little longer, producing smaller berries with thicker skins and more acidity, often with slightly lower alcohol too. The lush valley floor has the propensity to grow grapes that make softer, bigger and more forward wines. But of course it is not so simple as that. The quality of the farming and the skills of the winemaker make a huge difference, and careful management of the vineyards can allow real elegance in the valley, whilst elevation alone does not guarantee great wine from the mountains. Site – terroir if you like – is vitally important, but then so too is the masterplan of the experienced winemaker. If the mindset is right, the tools – both viticultural and oenological – are there to fashion multi-facteted wines, irrespective of altitude. Perched on the top of Howell Mountain, Cade is a start-up producing some beautiful wines under winemaker Danielle Cyrot. Elizabeth Vianna is crafting some beautifully balanced and elegant Stag’s Leap wines with a nod to classic Bordeaux style. Kings of sparkling wine, the beautiful Schramsberg estate boasts miles of caves carved deep beneath Diamond Mountain. The experienced Chris Phelps uses his Bordeaux-influenced background to great effect making wines at Napa’s Merlot specialist. Rocca Family Vineyards farms two beautiful estate vineyards, making a range of organic wines with minimal winemaker input. Maestros of Pinot and Chardonnay in Carneros, I meet up in Saintsbury’s idyllic tasting garden with co-founder David Graves. Also specialising in Pinot and Chardonnay, Cuvaison has seen considerable investment in facilities and vineyards under experienced winemaker Steve Rogstadt. Without a doubt, Mendocino’s wine industry sits in the shadows of its southerly neighbours in Napa and Sonoma. Winegrowers here told me they are paid lower prices for their fruit, whilst others complained that attracting the traditional pool of Mexican vineyard labour was becoming harder and harder. And yet splashed across the front page of The Wine Spectator in my hotel room there it was: “The New Frontier of Californian Pinot Noir: Mendocino’s Anderson Valley.” If this is a hot spot for California’s dream variety, then surely things can’t be all that bad? Driving through Mendocino’s sun-dappled countryside one passes fields of fruit, nuts and vegetables that stretch for miles. Here there is none of the gloss and none of the superficiality that can sometimes blight the world’s more fashionable wine routes. In many ways this is the ‘old California’, the sometimes rustic, slightly hippyish scene that I first saw when I visited in the 1980s, but which is now long gone from much of the State. Bigger than Napa and Sonoma put together, Mendocino runs all the way to the Oregon border and whilst still only a day trip from San Francisco, the extra effort needed to get there helps maintain its undoubted charm. If Mendocino means anything to European wine drinkers, it probably means organic. Frey Vineyards whom I would visit that morning was the USA’s first all-organic winery, whilst the giant Fetzer Vineyards really put Mendocino on the UK map with its popular and biodynamic Bonterra label. Parducci, also on my list of visits that day claims to the the worlds first carbon-neutral winery too. Sitting in Frey Vineyards charming winery garden as assorted dogs run back and forth, various Mrs Madrigal lookalikes patiently tend the garden, and bluebirds and hummingbirds flit around constantly, it is easy to see that a huge part of Mendocino’s charm – and its strength – is the strong beat of its rural heart and its people. Viticulture in Mendocino began in the 1850s, much of the intial planting done by Italian immigrants. As recently as 1997 there were only 36 wineries in operation. Today that number is 90-plus, with almost a third farming organically. Most are family-owned, by families with a long heritage in the area. Sited along the Russian and Navarro Rivers, this is a large and sparsely populated wine region, mountainous and much of it covered in forest. Weathered sandstone and volcanic soils predominate, with some red soils containing higher amounts of clay and with sandier, deeper amd more fertile soils on the valley floor. The climate here is Mediterranean, with cool, damp winters and warm and sunny summers. As with much of California’s wine country, the Pacific is a major influence, with fog and winds moderating temperatures especially towards the coast. Across Mendocino’s 10 American Viticultural Areas (AVAs), around 16,400 acres are planted to wine grapes with the predominant white variety being Chardonnay, followed by Sauvignon Blanc and then sizeable plantings of Gewurztraminer, Viognier and Chenin Blanc. For red wine varieties Cabernet Sauvignon and Pinot Noir dominate, with Zinfandel just a little behind, along with Merlot and Syrah. Of its 90-odd wineries, 10 are currently certified Biodynamic, a further 21 are certified organic and many more farm organically and environmentally without certification. The Anderson Valley is one Mendocino hot-spot, mainly because of its Pinot potential. But for my one day visit to the county I headed for another great AVA that lies along the Russian River, the Redwood Valley. 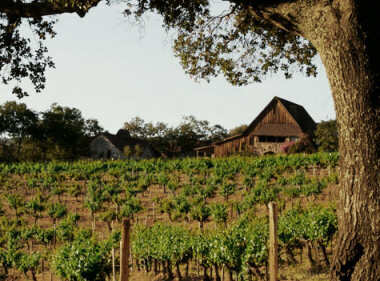 The Redwood Valley houses some of the county’s longest-established wineries, and is the AVA with the biggest acreage of organic vineyards in California. The first organic, and the first biodynamic winery in the USA, Frey’s down-home setting is a little piece of old Californian heaven. Having grown grapes in the valley since 1945, Charlie Barra may now be in his 80s, but he still heads up this family wine estate. Texan businessman Tim Thornhill moved from landscape gardening to one of Mendocino’s biggest names.